This is a short walk from my home. I am originally from New York, so, it took me a long time to get over not living near an ocean (actually, I am still not over that! ), not being able to bum around Manhattan, and, no mountains. It is VERY flat around here. However, over time, I have come to appreciate the 360 degree horizon and the beautiful skies. 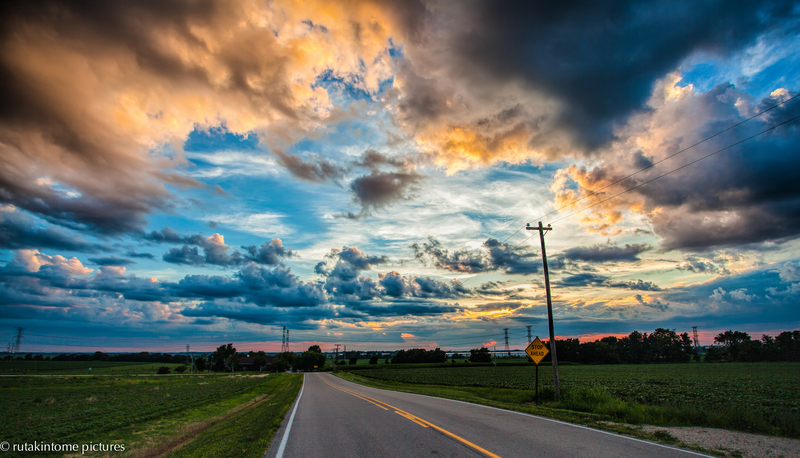 This is the first of two shots taken moments apart that are examples of beautiful skies. Born and raised in IL, lived in San Diego, CA; I know exactly what you mean. I miss the ocean, too. In order to find the hills here, go check Bolingbrook. It’s not mountains, but it’ll do. Lake Michigan isn’t an ocean, but it’ll do. I love the serenity of the sky in the morning and evening, just like the ocean; they change everyday. I understand you so very well. I grew up in Northern Germany, not directly on the beach but pretty close to the North Sea in a town that had a big river flowing through it. Then moved to the Rhine-Ruhr-Area in the middle of Germany. So, no more Atlantic coast but still big rivers, heavy industries, big inland harbours. Nobody here really understands what I’m missing, haha. Ingo: yes, very similar. I have very fond memories of the shore. I grew up on Long Island just a short car ride from the beautiful beaches along the southern edge of the island. For me, everything is “right” when I can be near the cold Atlantic ocean, walk on the sand, and, smell the salty air. Living near Lake Michigan is nice, but it is not the Atlantic!